Identcode Barcode Creator Add-on of RasterEdge DocImage SDK for .NET is a price-competitive, fast and royalty-free barcode generator toolkit, which can be perfectly integrated into C#.NET class image & document manipulating applications for Identcode barcode generation on target document and image files by C#.NET programming. Now, please have a look at the key features of RasterEdge Visual C#.NET Identcode barcode creator add-on. You can easily generator Identcode barcode and save it to image files/object using this C#.NET barcode generator control. 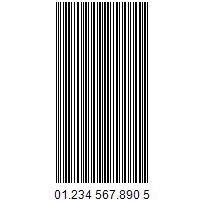 The following steps will show how to create a Identcode type barcode encoding numeric data text "01234567890" into the image object with XImage.Barcode.Creator. Please copy the sample code as follow to generator a Identcode barcode. As a part of RasterEdge DocImage SDK for .NET, this barcode creator add-on can be easily integrated into C#.NET image editing applications. Using this .NET Identcode barcode generator add-on, C#.NET developers are able to draw and add Identcode barcode on png, gif, jpeg and bmp raster image files. Besides, this C#.NET Identcode barcode creator add-on adopts the application of X and Y location, which helps developers to insert created Identcode barcode into the target place of image file. This .NET Identcode barcode generator control can be also used in C#.NET document processing applications. With this C#.NET Barcode Creator Add-on, it is an easy task to generate & insert an Identcode barcode image into PDF, TIFF, Word, Excel or PowerPoint document file. In details, if your target document is a multi-page file, RasterEdge Identcode barcode creator SDK allows you to select one defined page from source file and insert Identcode barcode accurately into the selected document page using C#.NET class code. Using the C# code below, you can insert an Identcode on a png image file. Besides, you are also given the ability to adjust each property value of generated Identcode barcode, such as size, color and resolution.